Sometimes technology innovations come along which cause a paradigm shift in how products are designed. A classic example is the television, where the shift from cathode ray tubes to flat-panel technologies like plasma and liquid crystal displays (LCD) caused furniture-makers to scramble to redesign their entire entertainment product lines. Large bulky entertainment cases that covered most of a living room wall were reduced to narrow consoles, and there has been a continual trickle-down effect on all the associated peripheral devices (DVD players, gaming consoles, streaming devices). So what does this have to do with ultraviolet (UV) disinfection? It is actually a good comparison for the coming changes, and associated design shifts required by UV-C LEDs — ultraviolet C (spectral range: 100 to 280 nanometers [nm]) light-emitting diodes — that are entering the disinfection market. 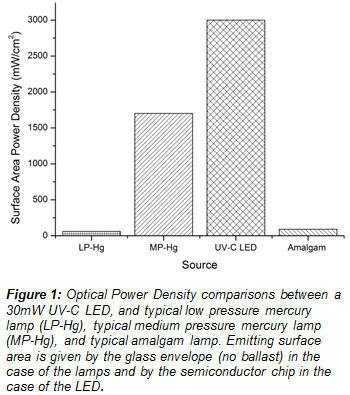 UV-C LEDs are both structurally and operationally different than mercury lamps. From a structural standpoint, UV-C LEDs are smaller and offer higher ultraviolet power densities than mercury-based UV lamps [Figure 1], meaning you can concentrate more light in a given area without the aid of external optical components and at a very small footprint. This is the primary reason UV-C LEDs were first used in analytical products despite their low output power. While the vast differences in package size between a UV-C LED and a mercury lamp are easily identifiable, the optical and thermal differences can have an even larger impact on system design. UV-C LEDs theoretically emit in all directions; however, they are limited by material and package restrictions to be directional point sources. A typical beam profile from a packaged UV-C LED will have most of the light fall within a 100- to 120-degree beam. This is usually defined by the viewing angle where the light intensity has fallen to 50 percent of the maximum. Such specific optical output characteristics allow a wide variety of possible intensity distributions in a LED based disinfection system. For instance, spot disinfection at a critical process point could be achieved with a single device, or alternately, a broad homogeneous intensity could be distributed over a specified area. The intensity could also be tailored to a specific pattern of lower intensity spots and higher intensity spots directly adjacent to each other. The optical output characteristics of UV-C LEDs raise the question of how to best exploit these features at the system level. Thermal considerations are important in LED systems as well as mercury systems. UV-C LEDs generate heat from the solid piece of semiconductor (the LED chip). This heat is extracted from the backside of the package holding the chip. Because the footprint of the packaged LED is small, cooling techniques can be used such as Peltier coolers or fans. These are located on the back of the package and can be as small as a centimeter. Active cooling techniques make it relatively easy to cool the LED to room temperature under hotter ambient conditions. This is fortunate since UV-C LEDs have an opposite reaction to ambient temperatures than mercury sources. 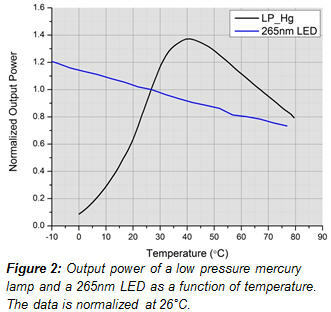 Unlike mercury sources, UV-C LEDs increase their optical output at cold ambient temperatures with decreasing outputs occurring at higher temperatures [Figure 2]. This makes UV-C LEDs ideal for refrigerated/cold applications where they require less heat management and no warm up time. From an operating standpoint, UV-C LEDs offer key design freedoms over traditional Hg technology. UV-C LEDs operate off of direct current (DC), which allows for portable, battery-powered system operation, and in general minimizes system electronics. One of the more neglected aspects of system design using UV-C LEDs may be in the area of back-end electronics. Back-end electronics can be used in ways similar to those of mercury lamps, by providing power to the LEDs as well as adding functionality to the system. Back-end electronics can be used to drive LEDs in pulsed or continuous modes of operation; they can monitor changes in the LED itself, such as changes in forward voltage or intensity, which can be used in feedback modes to bring the LED back within specified operating criteria or to signal failure. Back-end electronics can incorporate temperature control feedback or even perform wireless data logging, and because the entire system is DC, the entire circuit can co-locate with the LED source in a very small footprint. As mentioned earlier, UV-C LEDs are currently largely used in analytical products; however, a recent uptick since 2012 in the number of manufacturers producing UV-C LEDs has opened the door for more widespread applications. 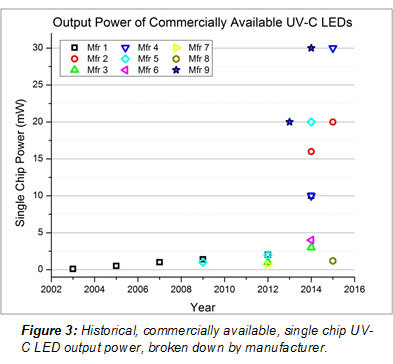 As indicated in Figure 3, between 2012 and 2015 UV-C LED were made commercially available by seven new manufacturers, with four of those having volume-scale production capabilities. Current single-chip optical output powers are as high as 30 milliwatts (mW) with lifetimes in the thousands of hours. Hero devices reported in the literature, and engineering grade samples were excluded from consideration, and this list should not be considered exhaustive of the field of manufacturers attempting to come into production. As those flat-screen TVs enabled smaller entertainment centers and accessories, the recent influx of commercial UV-C LED manufacturers — and the lower associated device costs — have paved the way for systems developed with smaller, lower-cost UV-LED sources. However, for any UV system developer wishing to exploit the technology benefits, it is key to understand the various elements that combine and interact to enable an efficient UV system [Figure 4]. System design methods for traditional mercury lamp-based UV systems have evolved considerably over the past 20 years, with the use of computational fluid dynamics (CFD) and biodosimetry now commonplace. These tools remain key to the development of UV-C LED-based UV systems. However, the starting point for design assumptions are very different, due to the fundamental structural and operational differences of the light sources discussed earlier. In addition, and crucially, the skill set needed to understand the integration of non-traditional reactor designs, with the unique thermal management and electronic design requirements of UV-C LEDs are very different from those developed in mercury-lamp UV system design. Similarly, as new flat-screen TV technology entered the market, cathode-ray tube TV manufacturers found themselves with a choice of either exiting the business or acquiring new expertise. Perhaps this can best be illustrated when comparing UV-C LED system performance figures published over the past few years [Figure 5]. The three highest-performing units — systems a, b, and c — were all developed by commercial companies not currently manufacturing traditional mercury-based UV systems. The highest performing unit, system a, was developed by Dot Metrics Technologies, now acquired by AquiSense Technologies, a group solely focused on holistic UV-C LED system design as shown in Figure 4. UV-C LED technology benefits such as instant start/stop, low-voltage supply, portability, and mercury-free safety have made LED-based systems attractive for many existing and new applications. But early-stage definition of the market for UV-C LED-based UV systems has been challenging, due to the historical high cost of UV-C LEDs and immature UV-C LED system product design. 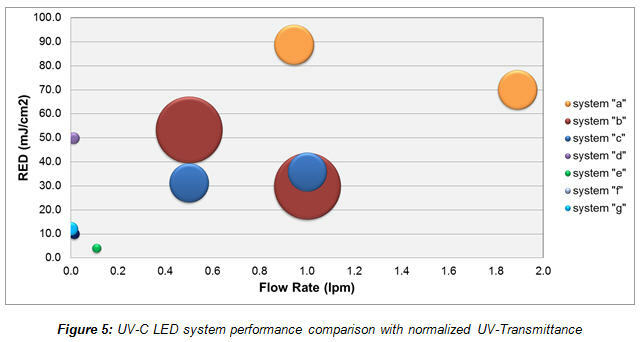 However, through pioneering early release products [Figure 6], it is clear that there are many potential applications where UV is not currently used that could be enabled by a UV-C LED system, as well as a host of existing UV applications that will switch near-term to an LED-based treatment system. The first applications have proven to be within less price-sensitive, low-flow water disinfection markets. A new wave of lower-cost UV-C LED sources will rapidly open larger market segments over the coming 18 months, as point-of-use UV-C LED-based water disinfection system prices are expected to fall to within 50 percent of equivalent mercury-based systems. Ultimately, the speed of market growth for UV-C LED technology in disinfection applications will likely follow those of other LED applications and be determined by a combination of LED supply volume/cost and the execution expertise of the early system manufacturers. Product reliability, third-party certifications, and supply chain management are not unique issues to LED technology, but must still be handled efficiently. Applications outside of water disinfection are likely to grow based on the same core technology benefits. Advanced oxidation, surface disinfection, and air treatment applications all have particular areas where the characteristics of UV-C LEDs can provide unique solutions. There is no doubt that current UV-C LEDs are low-power devices, with lower wall-plug efficiencies than traditional mercury-based UV lamps. However, there is also no doubt that these devices have benefited from very large investments and huge performance advances over a very short period of time. Large wafer-processing capacity in Asia for visible LEDs has led manufacturers to explore adjacent markets — with water providing a compelling case. Increasing volume manufacturing of these devices has a well-understood relationship to price reduction. Historically, semiconductor device technology has overtaken analog applications with increasing awareness of power consumption and heavy metal use, piquing the interest of many users, creating demand. By taking a holistic design approach to system efficiency and drawing on expertise not found within traditional UV system design offices, new UV-C LED-based disinfection systems have shown strong performance results. Perhaps, then, it is not a case of “if” LED’s will penetrate disinfection markets, but “when” and “how.” Just as the home entertainment industry underwent a paradigm shift in the transition from cathode-ray tubes to flat-screen technology, so too are we poised to see a historic shift in UV system design and operation. ​As co-founder of AquiSense Technologies, Oliver builds on over 17 years of UV disinfection experience. He previously served as President of Aquionics Inc. and held a number of research and operational positions at Wedeco (Xylem) in England, France, New Zealand, and Germany, before moving full-time to the U.S. in 2005. Oliver holds two engineering degrees from Manchester University in the United Kingdom. He actively serves on the board of directors of the International Ultraviolet Association (IUVA), currently in the position of Treasurer.